Minor corrections made August 26th. The image below depicts the original 1959 Austin MINI automobile next to the newest MINI concept, the Rocketman. 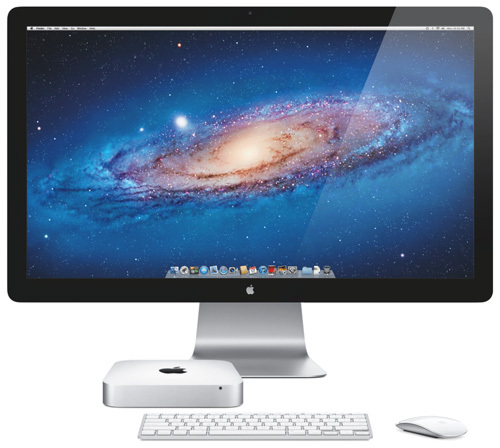 It's a visual metaphor of how far Apple's minimalist Mac mini has come since its first incarnation in January 2005. It's gone from a PowerPC G4 to an Intel Core i5/i7 processor. It's progressed from a Radeon 9200 GPU with 32MB DDR memory to Radeon HD 6630M with 256MB of GDDR5 memory. Instead of an 80GB Ultra ATA HDD, you can get it with a 750GB SATA HDD and a 256GB SATA SSD. Yet it weighs less and is thinner than the 2005 model. We begin our coverage of the 2011 Mac mini's performance with some basic benchmarks comparing four different 2011 models. Since we consider the MacBook Air the other minimalistic Mac, we included three of those models in the graphs. Though it appears to be just another artificial benchmark, Cinebench uses code from a real world 3D modeling app, Cinema 4D. The numbers in the two graphs represent a rating that Cinebench gives. Higher is better. The RED bar represents the fastest. The overall score combines the integer, floating point, and two memory tests into one overall score. (LONGER bar means faster rating.) Note we used the 64-bit version. The RED bar represents the fastest. Why a Mac mini? For some it's about price. It's the lowest priced Mac you can buy in 2011 (assuming you already have a display, keyboard, and mouse). For some it's about the small footprint as illustrated in the picture above. As expected, it's faster than a MacBook Air but slower than a Quad-Core i7 MacBook Pro or Quad-Core i7 iMac. One interesting feature of the top Mac mini models (2.5GHz Core i5 and 2.7GHz Core i7) is the AMD Radeon HD 6630M dedicated GPU which allows it to run graphics intensive functions much faster than the low-end 2.3GHz model with the Intel HD 3000 integrated GPU. It's also much faster than all models of MacBook Air as well as the 13" MacBook Pro. Take a look at the Portal and Motion graphs below. So, even though the 2011 mini server may have a quad-core i7, it will lag behind the 2011 mini with dual-core i5 or i7 when it comes to graphics intensive tasks.